New LPL Market Signals Podcast. On our latest LPL Research podcast, due out later today, Chief Investment Strategist John Lynch and Senior Market Strategist Ryan Detrick reflect on their memories of the financial crisis, and discuss the changes in today’s market landscape 10 years later. Please join our discussion on social via #LPLMarketSignals. China strikes back. On Tuesday, China announced another $60 billion in tariffs on U.S. goods effective September 24. 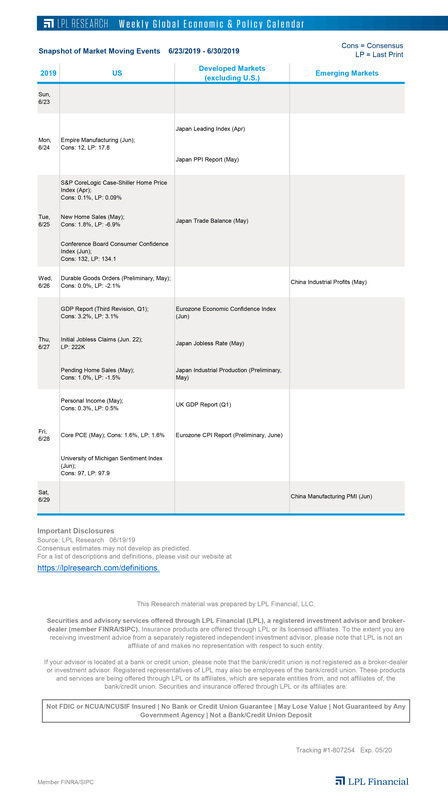 China’s latest levies are in response to the U.S.’ $200 billion round of tariffs and threats of a steeper rate if no agreement is reached by the end of this year. Today, global markets are taking recent trade developments in stride, staying optimistic that the latest tariffs will force the U.S. and China into a negotiation by year-end. The Shanghai Composite is poised for its best two-day gain since July (and second-best two-day gain in 2 years), while European shares climbed slightly. The S&P 500 Index is up slightly today. BOJ leaves rates unchanged. The Bank of Japan (BOJ) announced late yesterday that it would keep its policy rate unchanged at -0.1%, a decision many expected as Japan struggles with low inflation and global trade risks escalate. Japanese shares climbed for a seventh straight day, extending their gains to 6% since September 7. Inconsistent housing recovery evident in August data. Housing starts, or the number of new housing units that have started construction, grew 9.2% in August, higher than consensus estimates for a 5.7% gain. On the other hand, building permits declined 5.7% month over month, their biggest slide since February 2017. Yesterday, a report showed the NAHB homebuilders’ sentiment index remained unchanged at a 10-month low in August. The housing recovery continues to flash conflicting signs, even as consumer sentiment has climbed in other areas of the economy. Housing is an important part of output, accounting for approximately 15% of gross domestic product (GDP) if you include the money spent on construction, maintenance, and rent. A few innings left. We’ve highlighted several indicators recently that have historically flashed predictive signals for changes in the business cycle (many of which are covered in our Recession Watch Dashboard). On the LPL Research blog, due out later today, we take a look at the current real fed funds rate (the Federal Reserve’s target short-term interest rate minus inflation) and highlight why this indicator could be forecasting future economic gains.